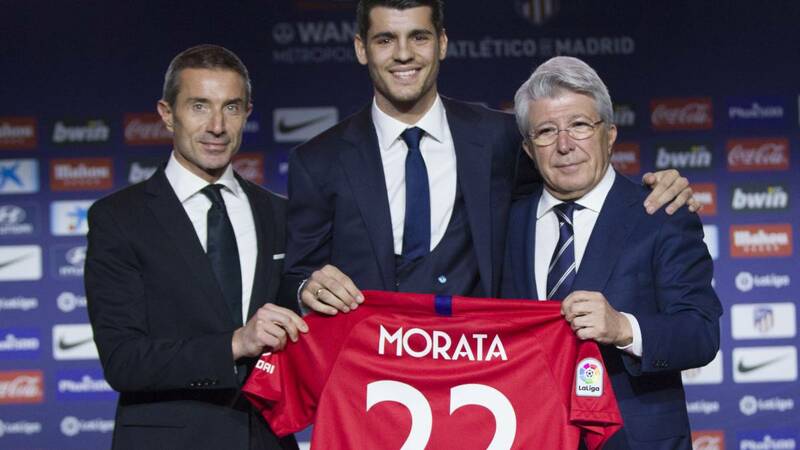 Home Soccer Morata: "If I'm in Atleti, it's because I want to be here"
Morata: "If I'm in Atleti, it's because I want to be here"
The new Atletico striker, aged 26, was introduced at the Metropolitan Wanda: "I had given my word that when I could, I would come." Alvaro Morata has been introduced as Atlético de Madrid soccer player. The striker, aged 26, received his shirt with dorsal 22 and the welcome of Enrique Cerezo, who reviewed his previous career in Atleti. After a video with images of the player from when he was a child dressed as a rojiblanco and accompanied by his family and Manuel Briñas and Soco, who had him under his tutelage in his rojiblanco squad, Morata took the floor to reaffirm his happiness for being In his new team: "I've made a lot of detours, but the fate was that I was in Atlético, if I'm here it's because I want to be here." How are you doing? I'm very good, very proud, I know the great effort what has been done and I am very happy to be here. What do you remember about your athletic stage? It is childhood, complete happiness, that is why it is so much to be here. People who know me know this and the video has moved me. What have you talked with Simeone? You did not have to convince me. He knew that due to the circumstances of life there have been many detours but I think that the destination was that he was here. I can not wait to train with my teammates and I am very grateful because I have fought to be here. How was the process? The situation is easy, everything stops when SuperLópez (his representative Juanma López) tells me that this possibility, all this is very nice and I can not wait to start training, to see Koke, who was taller than me. Is it different for you to other presentations? I feel part of the club for a couple of weeks, I do not feel new. The teammates have been worried about writing me and it makes me very happy. What did Simeone say in that derby? I'll take it for us, I think it's more beautiful and it's free for the imagination. Now I am sitting here and if you throw imagination ... I can not wait to train with them, you can intuit. Have you thought about marking against Madrid and Juventus? Well blessed problem, I hope you have to think several times because I would like to say that things are going well and if things happen they will go alone. Have you talked to people from Juventus? I have talked about life with my ex-partners, not football. I concentrate on playing and when the tie is coming we will see. Do you keep the athletic feeling? I think that today I do not have to explain my feelings here, if I'm here it's because I want to be here. I had given my word that as soon as it could be done I would come here and I have to speak with acts and not with words. How is your relationship with Diego Costa? Besides a great player is my friend, I have spoken with him when I have had difficult moments or when he has had them and why we are not going to play together. I'm sure he'll play some joke on me and I really want to see him.